Get the Seattle Soccer Examiner widget and many other great free widgets at Widgetbox! In their first home match in PCSL history, back on May 17th, with many players in Arizona competing in USASA Nationals, the Wolves hosted defending PCSL champions, Victoria United, losing 0-3. In a match which was much closer than the score line, the Wolves walked away looking forward to facing United in Victoria later in the season. Unfortunately, the result remained the same when they did. Two early goals gave Victoria a lead which they would hold on to. The Wolves fell 4-2, capping off a disappointing road trip, which knocked them out of qualifying positions for both the Challenge Cup and J.F. Kennedy Cup (temporarily). 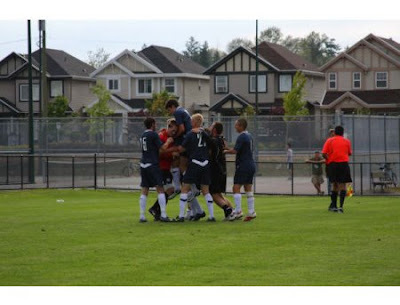 Victoria United has proven to be the class of the Pacific Coast Soccer League. Their Men's Premier side has won the PCSL Premier the last two seasons, and United also took home the Challenge Cup in 2007. Both their Men's Reserve side and Women's Premier side, the Victoria Stars, reached the 2008 Challenge Cup finals as well. The Wolves, satisfied by their 10-4-4, 3rd place, record in their first PCSL season, were hungry to make their mark on the PCSL by showing that they could compete with the best, even though they were the newcomers. In both their season meetings, United had taken a 2-3 goal lead going into the half, and the Wolves were determined to keep this match much closer. Like clockwork, United struck first, in the 15th minute. A disorganized Wolves' midfield lost their marks in the box, and a low, driven cross met the foot of United's Captain, who hammered it home for the 1-0 lead. United wouldn't strike again in the first half, and in the 42nd minute, Wolves' forward, Clay Walton-House, out hustled the Victoria back line, leveling the score going into half-time. Saturday's victory celebration was not repeated in the Final on Sunday. Both sides had their opportunities on goal in the second half, but neither converted until the 75th minute. Poor 1 v. 1 defending by the Wolves defensive back four allowed a United striker a clear shot on goal within the 18-yard box. The opportunity was converted, and United took the 2-1 lead into the final 15 minutes. Pushing for the equalizer, United's goal keeper came up with key saves. United would score again shortly before the final whistle, sweeping the League Table and Cup for the second year in a row. A quiet Seattle locker room post-match was filled with players wanting to remember this feeling for future reference. Seattle now has the week off after competing in 2 league matches and 5 cup matches within the last 10 days. The club looks to revitalize itself before travelling to Bellingham on the 16th of August to compete in the J.F. Kennedy Cup. For the Wolves complete schedule, visit SeattleWolvesFC.com . Get gear and support this blog at the same time! When you order through this banner the GOALSeattle Blog gets 8% of the total back to help support Seattle soccer news. Add GS to your website! Get news from this blog on your own website! "Flying Pies in the Boot Room!" Who's going up with Seba? Win a FREE "I voted Sounders" T-Shirt!